The HNC hit the trails and headed south for some inter-conference games. 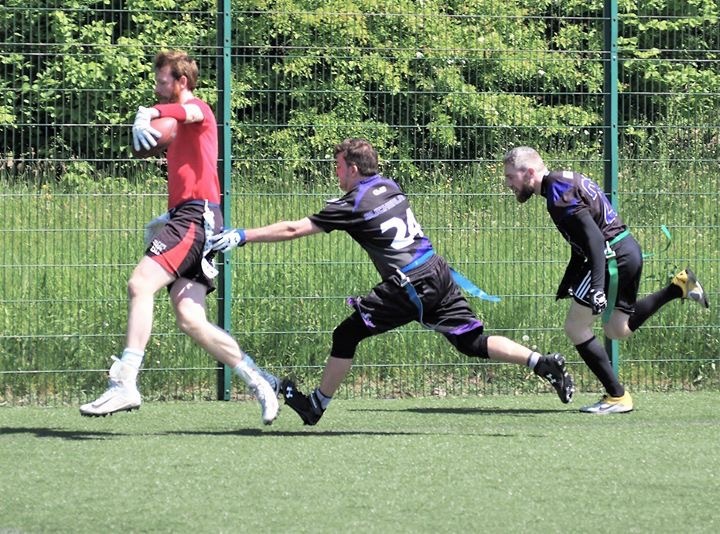 Aberdeen, Grangemouth and Edinburgh travelled to Newcastle to face the Blackhawks, Manchester Titans and Manchester Crows, while the Hornets and Comets were in sunny Sheffield to take on the hosting Giants, Vipers and Leeds Samurai. Here’s what we learned from the action! The Broncos were our team to watch for the weekend, and by golly did they show up. Scott McKenzie recovered from what looked like a devastating knee injury to put in the Broncos’ most complete performances to date. 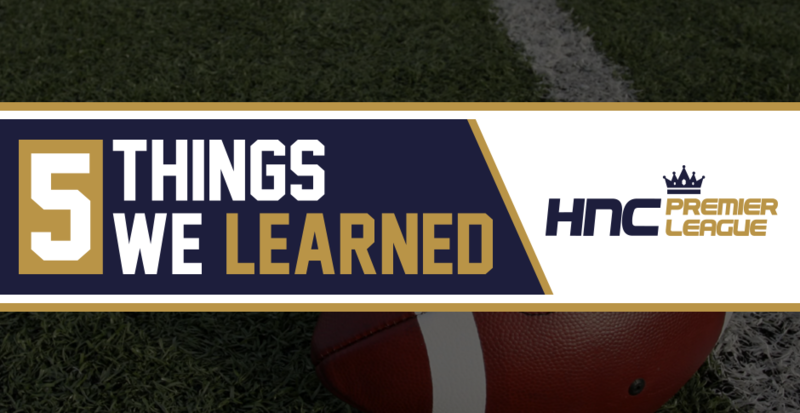 In what could have been some difficult contests, the Broncos got through with relative ease in the final scores, but at points against the Titans and Blackhawks, it did get tight. Still, the Broncos showed the mental toughness that had been lacking to power through and keep their championship aspirations alive. They’re now down Kevin Woods for the remainder of the season as he heads across the Atlantic. We figured Scott McCracken would play an important role at the receiver position for the Broncos going forward, but he’s transferred back to Carnegie Flag. With their premier division squad already a little threadbare, we’re curious to see how the Broncos fill the void left by both Kevin and Scott. The Broncos also figure to be without vanguard Fraser Thomson for an extended period as he suffered a major injury at Big Bowl. We wish Fraser well in his recovery, and hope to see him on the field soon! So there’s no such thing as an Oilcat. Really sorry to break it to everyone, it’s not some slick, black feline creature you’ll be devastated to learn. Therefore, we’re not really sure what this fictional beast would sound like if it roared. On this weekend though, it would probably sound a little bit like, “We’re still awesome, you should all be terrified of us”. Aberdeen absolutely breezed through their first set of cross-conference fixtures. With a strong squad travelling (this in itself is good, as they have historically struggled to get their best team together when they need to head south of the border), the Oilcats took care of business with minimal fuss. Despite their loss to Glasgow, we still see them as 1 and 1A in the HNC for now. Gary is playing the best football he has for years, and the talent surrounding him is playing up to his level at the moment. Aberdeen and the Broncos doing great really shouldn’t be all that surprising. They’re both two of the most talented teams on British soil. The Outlaws have been flirting with a spot in Division One since the start of the season, but a tight win over the Comets gave their season some hope. Their exploits in Newcastle will give them real belief that they can cling on to survival. Honestly, the Outlaws surprised us. We thought they’d probably have the beating of the Blackhawks. 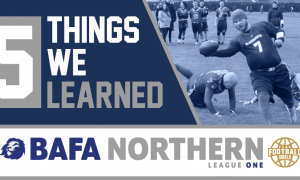 The Outlaws have two legitimate stars at difference making positions, safety and receiver, in both Jamie Archibald and Alessandro Marello respectively, and the former stepped up in a big way to give his team a huge upset victory over the Manchester Crows. The Crows prior to this weekend would have been looked at as a real favourite in the plate competition, and if not that, they could sneak into the championship bracket. The Outlaws squeaked a 2 point win, and had to show real resolve to secure this. After giving up a last-gasp Hail Mary score, the Crows went for 2 to tie things up. Jamie Archibald batted the ball down to give his side a season-changing win. If the Outlaws had gone home 1-2, we’d have been worried about them, but at 2-1 they look odds-on to stay up. The Edinburgh scores were bad news for the Comets. The Inverclyde side went 1-2 on the day, as just about expected, given the Sheffield Vipers were back to full strength. The win over Leeds was a nice little bonus though, and when the remaining MEC teams come to Glasgow this month, the Comets figure to have their own roster full of talent again. What was good news for the Comets is the number of players they had for such an arduous journey. They looked arguably the strongest they have all year with plenty of rotation available to spell their star players. Chris Lang is also improving at the QB position, and this is allowing Bud McFerren to use his speed against opposition defenders. If they can match the Outlaws’ performance against the Manchester sides, and the Blackhawks, then it all comes down to their final game against the Outlaws for survival! 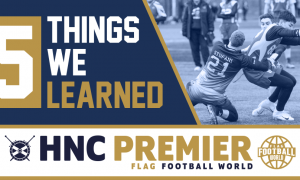 The Hornets had a chance to break the jinx that the Sheffield Giants, formerly Predators, have had over them. 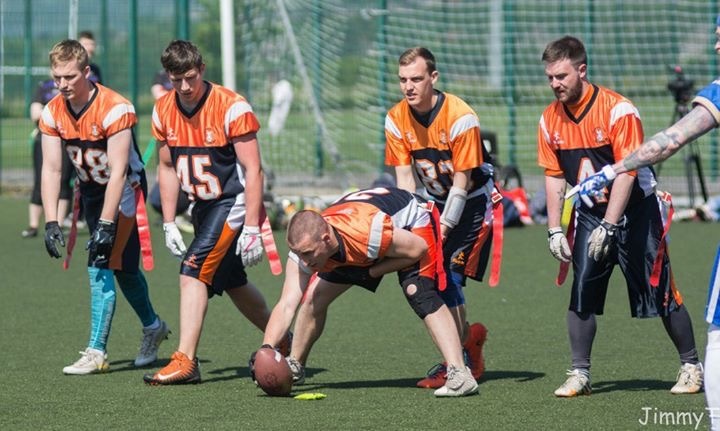 They lost in an epic duel against the Predators three years ago, and last season the Giants took advantage of a lacklustre performance from the Hornets to pip them to the 3rd and final podium place at Britbowl. The script was flipped this weekend though, as the Hornets picked up a 9 point win over the Giants. Early in the contest, it looked like the Hornets would run away with the game, but the Giants clawed back to keep within a score throughout the game. A late TD, followed by a huge 2 XP conversion, gave the Hornets defence the impetus to stop the Giants one last time. This game was mostly about who took their chances. 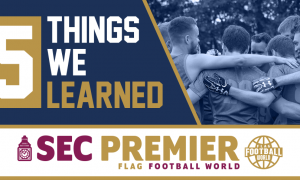 The Hornets snagged two interceptions through Andrew Gibson and Nicky Farrell in each half, both with assists from Kas Arshad who put consistent pressure on Dean Whittingslow throughout the contest. The Giants failed to turn the Hornets over as Alan Young and the offence were safe with the ball.